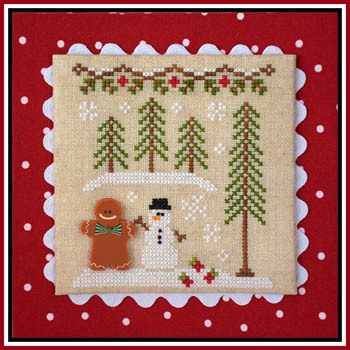 Gingerbread Boy and Snowman, # 7 of the Gingerbread Village series from Country Cottage Needleworks is stitched on 16/32 count Lambswool or a fabric of your choice with a stitch count of 55w x 60h. DMC, Classic Colorworks and Weeks Dye Works fibers are used. A Gingerbread Boy button is available for $3.50.